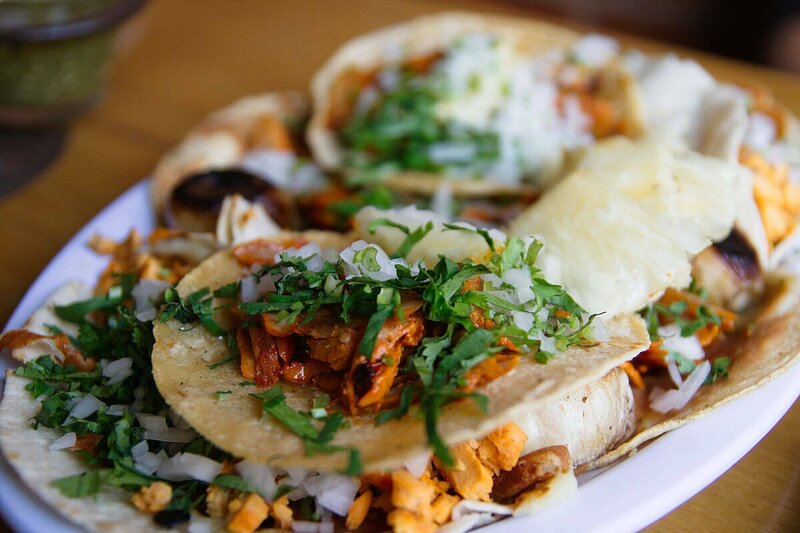 While some might argue that the best tacos in Mexico City are elsewhere (and this may be true), there are also some seriously delicious tacos in these two popular Mexico City neighborhoods. 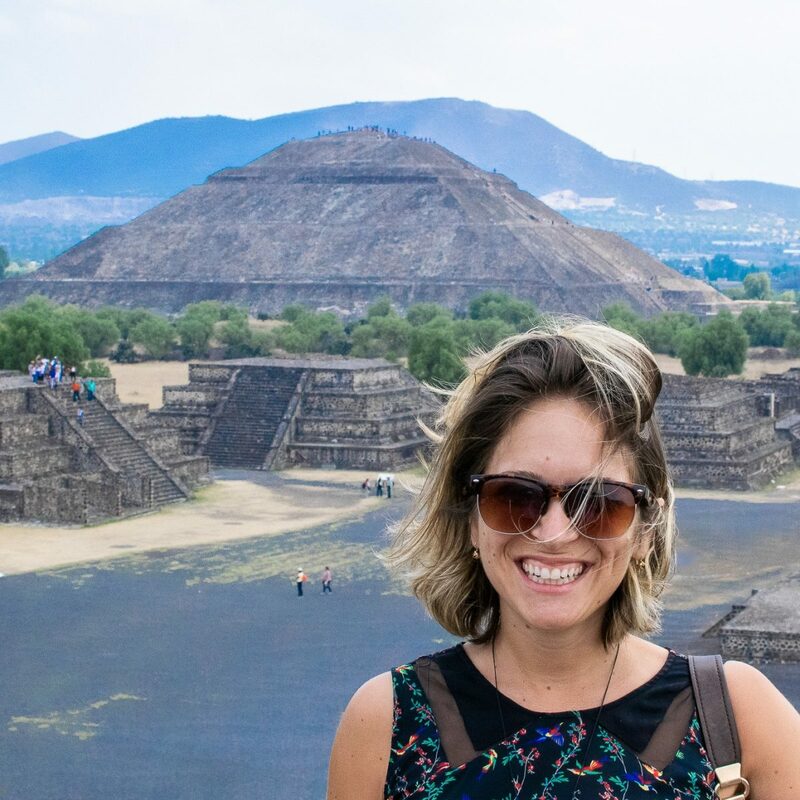 If you are staying in these areas during your trip to Mexico City, fear not, you can still get some seriously delicious tacos in Roma and Condesa. 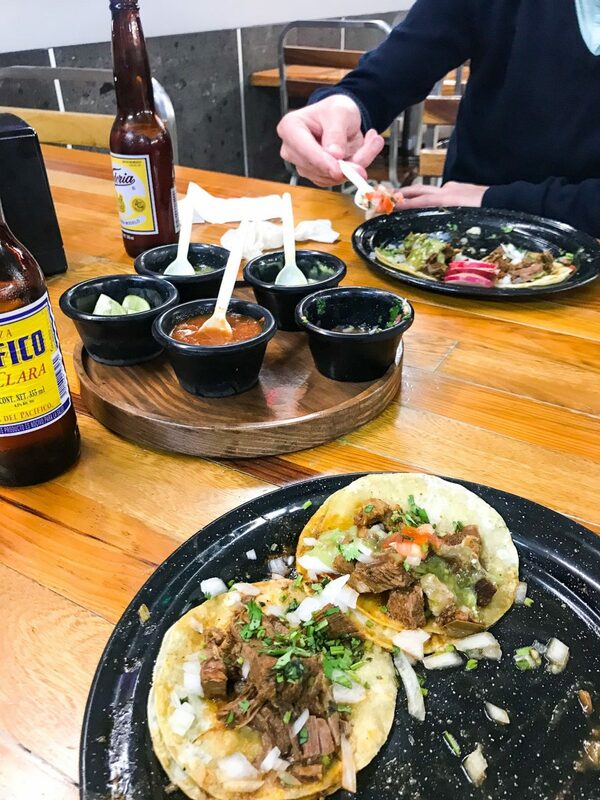 If you need a little lesson in what you’re going to find at these taco spots around Mexico City, check out my article Everything You Need to Know About Street Food in Mexico City. Roma is one of my favorite places to spend time. If you’ve grabbed a copy of my guidebook, you’ll know that I have a TON of recommendations for this neighborhood. It’s where I spend most of my time when I’m looking for a good coffee shop, bar, restaurant, and even a good taco. This is in no particular order, so the first recommendation is just as good as the last. Orinoco is actually a Northern-style taco place. It is originally from Monterrey, but they opened this branch in Mexico City over a year ago and it has been crazy popular ever since. Don’t be surprised if you have to wait in line on the steps outside in order to place your order and grab a table. I promise it’s worth the wait. They only serve three types of tacos: trompo (which is basically the Northern Mexico version of Pastor), arrachera (delicious steak), and chicharron (fried pig’s skin with a little bit of meat on it). I am a huge fan of pastor from Mexico City, so the trompo here isn’t my favorite, but the other two types of tacos are utterly delicious. I also really like their larger dishes like the pirata. This is kind of like a gringa with a large tortilla folded over and filled with steak and cheese. If I’m feeling really hungry, this is what I’ll order. The smashed potatoes (papas) are also seriously good. 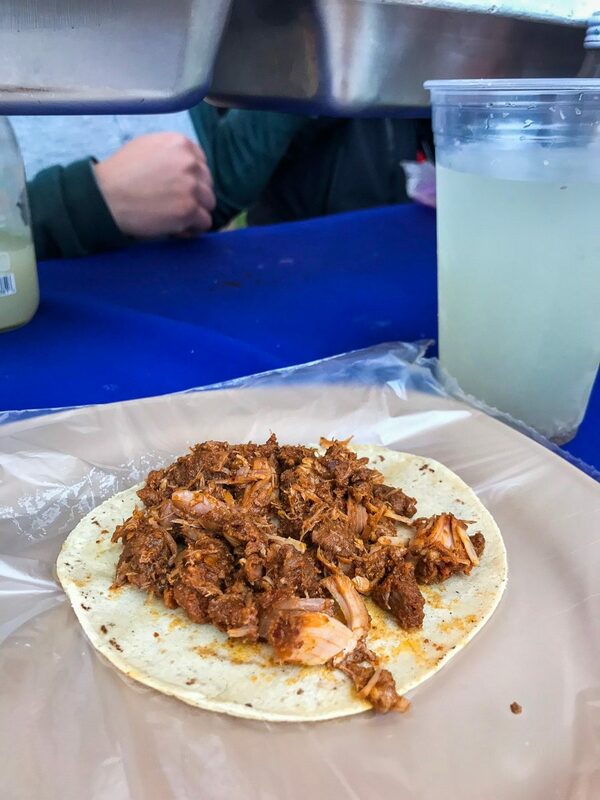 The incredible tacos from Tacos Orinoco – I’ve tried them all and now I stick to the chicharron because it is just SO good. It comes with a few little potatoes which are tasty, too. After nearly three years of trying different tacos al pastor around Mexico City, this humble taco place remains one of my absolute favorite places to have it. It’s a popular late-night spot since most days of the week it’s open well into the early morning (5am on the weekends!). The tacos aren’t just good because you’ve had a few too many beers, though, I promise. Besides the classic pastor tacos, I also love the envueltos. Choose what type of meat you’d like and then it’s cooked up on the flat top and wrapped in cheese that is also melted to perfection on the flat top. It’s served with two flour tortillas. This is a chain around Mexico City, but the Roma Norte location on Alvaro Obregon is one of my favorites. They have nice outdoor seating and the food is always really delicious here. Again, a great spot for pastor tacos, but I also really love their steak tacos (bistec). The star of the show has to be the jugo de carne. It’s a soup packed with meat flavor and pieces of meat. Order a side of tortillas to dip in it. This is a great spot for all different types of tacos. There are two locations on Alvaro Obregon, but I much prefer the location on the corner of Calle Frontera. The pastor is good, but I really love the bistec alambre. Alambres are plates of meat that have been cooked with onions, peppers, and usually bacon or ham. They serve you it with a big side of tortillas so that you can make your own tacos. Ok, very generic, but there is a cluster of street stalls along Alvaro Obregon right on the corner with Insurgentes. The one that I’m referring to is the one that is closest to Insurgentes and if you are looking at Insurgentes, this one is on your left side. This is the best street stall for pastor tacos and gringas in all of Roma Norte. Order one or both of these things and top is with their salsas and you’ll be happy as can be. According to Google, the name of this taco stand is literally Ricas Carnitas Taco Stand. It’s located on Insurgentes right across from the Sonora Metrobus station. The nearest street corner is Calle Queretaro. They are some of the best carnitas that you can have in all of Mexico City in my opinion. You can have a mixture of all of the different meats or you can simply order the cuts that you like. If you just want leg meat, ask for chamorro. Otherwise you’ll end up with all types of cuts (ears, snout, skin, etc). I think it’s nice to have one mixed taco and one chamorro. They are very big so you don’t need many. This is the place you want to look for. Taco Mio is located inside the Tianguis which is in Plaza de Oro in Roma Norte. It may be easier to head to Fuente de Cibeles in Roma Norte and then you’ll see the tents. The market is only on Wednesdays, Saturdays, and Sundays. Walk into the entrance to the right as you are looking at it and walk until you hit all of the restaurants. Look for the neon sign that says Taco Mio and then immediately find a seat. There are a few things on the menu, but really the only reason to come here for the mixiote tacos (mee-chee-oh-tay). I usually eat three and I’m full and then I order one more because they are so delicious and I have no self-discipline. There are a few toppings on the table, but my personal favorites are the habanero onions (you only need a few, it’s SPICY!) and the dark smoky red sauce. If you want to have carnitas in a sit-down restaurant, this is a really great spot. 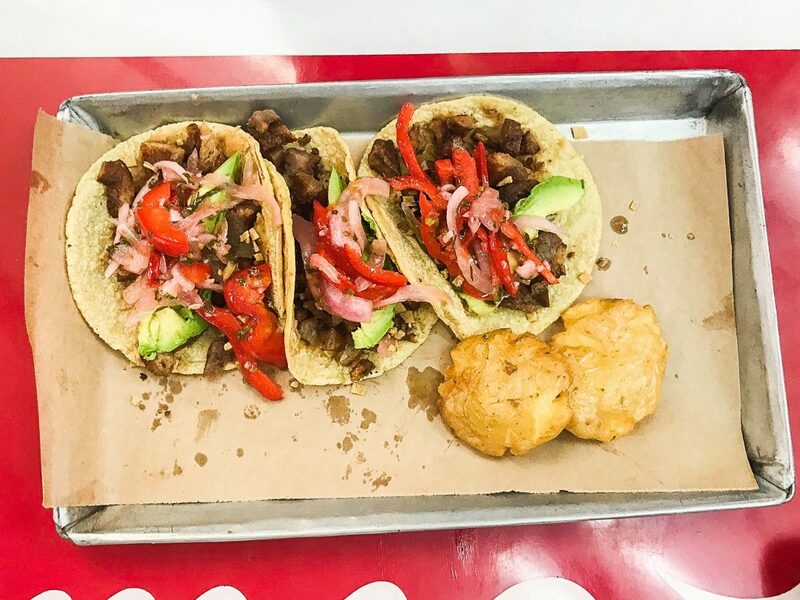 It’s perfect for a group of three or more because you can get meat by the kilo and it comes with gorditas, avocado, chicharron, beans, and plenty of tortillas. It also usually includes soft drinks, but not beers. I also recommend their barbacoa. If you just want to try a few different things, order a few carnitas tacos and a few barbacoa tacos. You’ll be full of rich meat all day long (and you may need to have a nap afterward). This is a mixiote taco and it is one of the most delicious things you’ll ever eat. I only recently learned about this place. 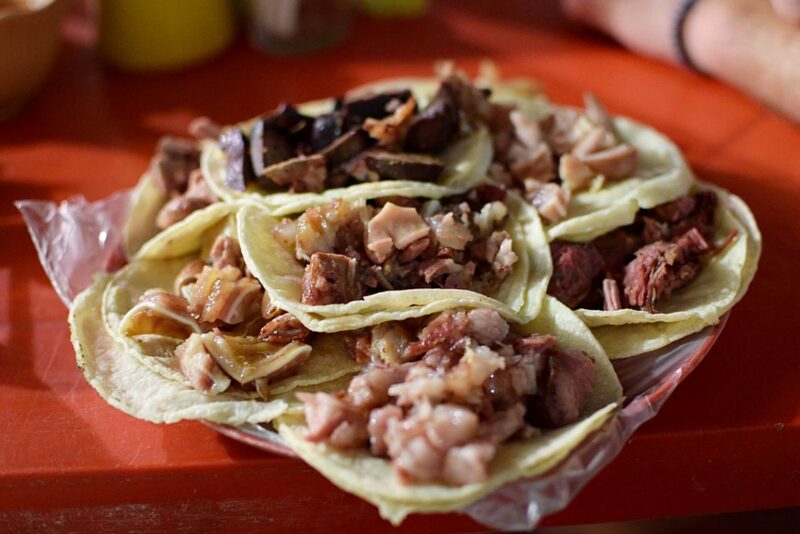 It’s located inside Mercado Medellin and serves up some seriously delicious carnitas tacos. Order the maciza if you just want to have white meat (and a bit of dark meat). Opt for surtido tacos if you want allllll of the different bits, you know what I’m saying? Be sure to also order a side of their chicharron. It’s some of the best I’ve had in the entire city. Want to try some vegan tacos? Whether you’re vegan, vegetarian, or meat-loving, you will enjoy these tacos. I recently visited with a friend who is vegetarian and we ordered a bunch of the tacos. My personal favorites were the red chorizo and the green chorizo. Obviously, there is not meat in the taco, but you would never be able to tell. They also have simple things like grilled mushrooms and nopales (cactus). They have beans made without any pig fat (difficult to find in Mexico City), grilled potatoes without mayo on top, and tons of other delicious toppings all completely vegan. Check out this article for other vegan restaurants around Mexico City. My boyfriend always teases me about Los Parados because the tacos are so good, but I hate the system they have. You go to the counter and order your tacos. There are tacos from the grill, pastor tacos, and beef pastor tacos. Once you pay, you get a receipt. You then take that receipt to all of the different people in order to get your taco, but there’s only one receipt, so you have to wait for the first guy to finish with your order before you can take the receipt to the next guy. It’s all a bit silly in my opinion. That being said, it is worth the small hassle. The tacos, particularly the beef pastor tacos are outrageously good and totally different to anything I’ve had before. It’s very busy late night, but if you come for dinner around 7 or 8 it’s not actually that busy. This is perhaps the most famous place in the entire city to come for barbacoa. They are only open Friday-Sunday and once they run out of meat they close (although I’ve never seen them run out of meat and I’ve come close to closing time in the past). It’s all about the barbacoa, slow roasted sheep (or goat?) in maguey leaves. When you enter the restaurant you’ll be hit by the smell and your mouth will start watering. Near the bar, you can see the big bin full of meat. Order it by weight, for two half a kilo is usually more than enough. It’s served with tortillas, onions, cilantro, and plenty of salsa options. Although it’s much more of a restaurant than the other places on this list, they only take cash here, so come prepared. Condesa gets a bad reputation for being too snooty or not having “proper” Mexican food. This couldn’t be further from the truth. 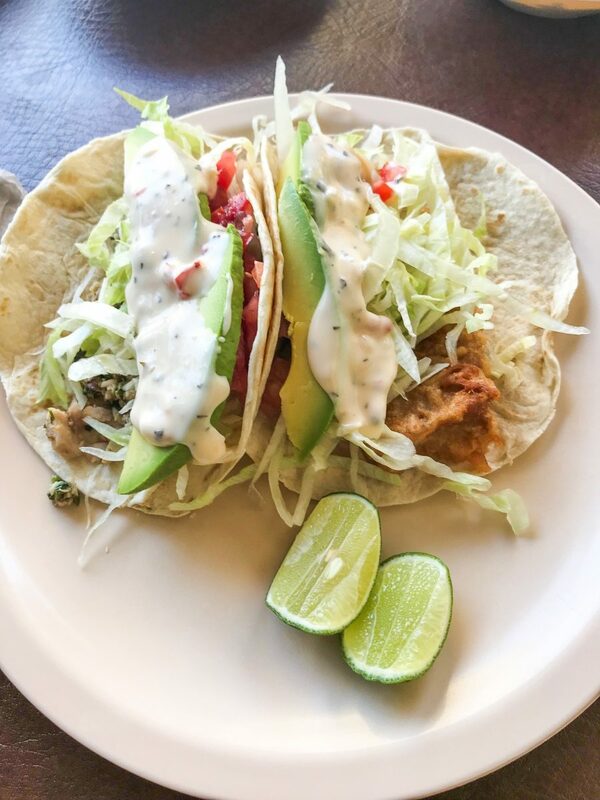 Yes, you can get good Japanese and Italian and Israeli food here, but you can also get some seriously good tacos. Tacos Hola is a Condesa institution. It’s busiest in the late morning for breakfast when people come for a few guisado tacos. Guisado is basically a type of stew, but it can be anything. This place is vegetarian, vegan, and gluten-free-friendly, but they also have delicious stewed meat dishes, too. I particularly love their cauliflower taco and their huitlacoche (corn fungus). For some of the best tacos arabe, you can’t miss a meal at El Greco. It’s a tiny little place, so you may have to wait a few minutes for a seat. Alternatively, you can take it to go and bring it into the nearby Parque Mexico and enjoy tacos on a park bench. The Donerakay tacos with pan arabe are what you should order (in my humble opinion). They’ll slice the meat off of the shwarma-style spit outside and put it into a nice thick pita-like tortilla. The salsas here are notoriously ferocious, you’ve been warned! This is one of my current favorite spots for tacos al pastor in Condesa. The meat here is particularly well seasoned and is so juicy. They top it with a huge piece of pineapple and you can choose from a huge range of salsas. They also have what they call Farolazos, which are kind of like burritos. You choose what meat you want to have inside and it’s then also filled with cheese, guacamole, and refried beans. It’s served with a side of grilled onions and it’s one of my favorite late-night eats. 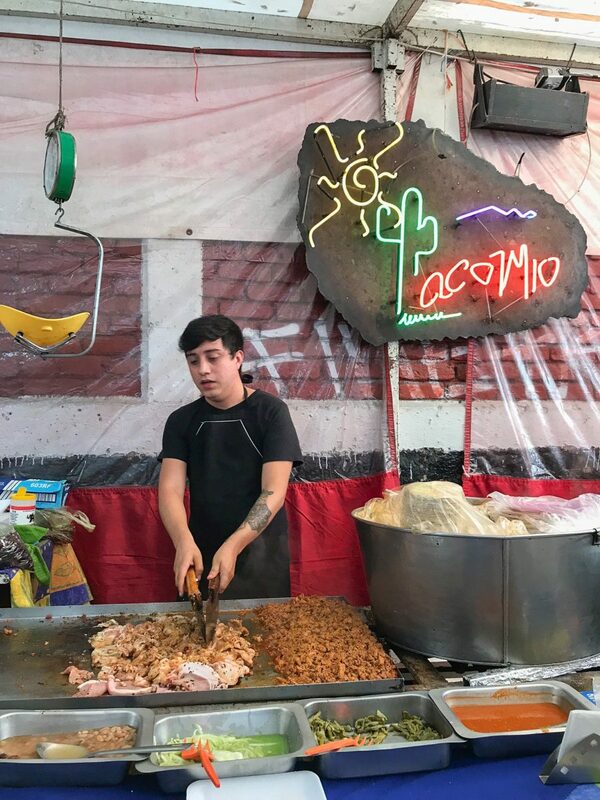 This is a famous spot all over Mexico City and the location along Tamaulipas claims to be the first place to ever serve tacos al pastor. Whether this is true or not, the pastor is wildly delicious here. They are one of few places in Mexico City still using charcoal fire and the way that this cooks the meat makes the outside a little bit charred and the inside perfectly juicy. When you order food here, you get a tray of dips and a plate of chips. I live for their hot and spicy bean dip. It’s one of the most delicious things I’ve ever eaten. I’ve tried to get the waiter to tell me what’s in it, he either doesn’t know or keeps a good secret. 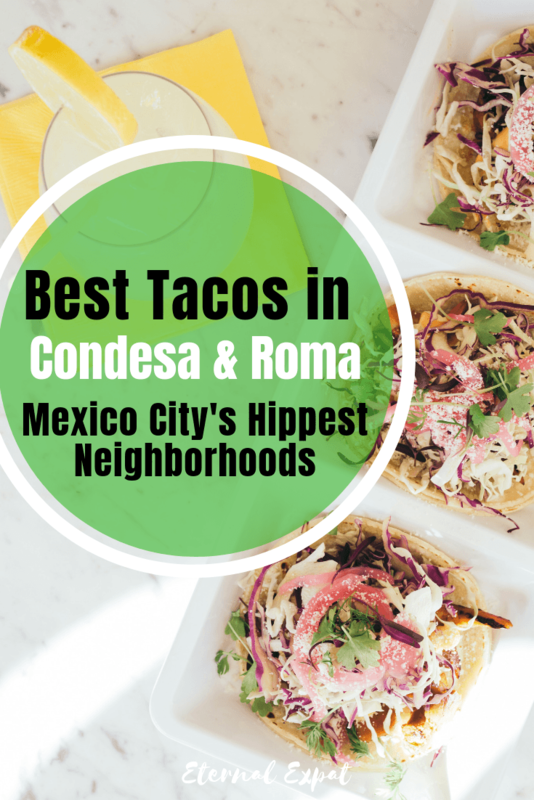 Condesa is full of great bars and clubs, so it makes sense that it is also home to some of the best late-night taco spots. Most of the places that I’ve mentioned above are open way past midnight, and Kaliman is perhaps one of my favorites after a night of fun. It’s open most nights until 2am and until 4am on Thursday, Friday, and Saturday nights. I’ve tried several things on their menu and enjoyed them all: the pastor tacos, the pastor alamabre, the arrachera alambre, the bistec tacos, and even the flan is good. This is another chain around Mexico City, but I do love their location in Condesa second best (my favorite location is in the Centro Historico but only because there’s more space). The regular fish tacos are good, but the marlin and the shrimp (camaron) are seriously why I keep come back. I usually get one marlin taco and one shrimp, but if I’m feeling fancy I’ll order one marlin and one campechano which is a combination of a few pieces of fish and a few pieces of shrimp. It’s delicious. They also have a few options that don’t include fish (stuffed chilis and cheese options, mostly). When you walk into the restaurant, someone will take your drink order while you wait in line. They’ll place your drinks at a table for you. Then you order what you want to eat and you get a little piece of paper. If you want more tacos, skip the line and just go straight back to the front with your piece of paper. Then just hand that paper to the guy at the register when you’re ready to pay.